The What: The SMP 352 Dual Recording H.264 Streaming Media Processor is the latest addition to Extron’s SMP 300 Series of H.264 Streaming Media Processors. 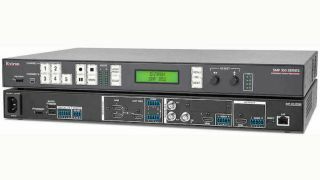 The What Else: The SMP 352 is a high-performance streaming and recording processor for capturing and distributing AV sources and presentations as live streaming or recorded media. It can create independent recordings from two different sources, and incorporates Extron’s FlexOS, a flexible platform for automating system operation. The SMP 352 accepts HDMI, component, composite, and optional 3G-SDI signals and applies two-window processing to selected sources. It can record and stream simultaneously and can stream at two different resolutions and bitrates concurrently using a range of transport protocols and session management options. With no licensing fees and comprehensive control and configuration features, the SMP 352 is a cost-effective, integration-friendly solution for delivering presentations to a larger audience. "In response to requests from customers, we’ve continued to expand our line of H.264 streaming products with the addition of the SMP 352, a powerful H.264 streaming media processor with integrated dual recording capabilities," said Casey Hall, vice president of sales and marketing for Extron. "With the SMP 352, customers can simultaneously capture recordings of both a presenter and their content separately, giving viewers the flexibility to choose layouts that create compelling presentations." The Bottom Line: SMP 352 processors are ideal for use in virtually any professional environment where AV sources can be streamed live or recorded for future reference, especially when combining multiple AV sources will enhance the message. Streaming and recording AV presentations allows an organization to communicate and train employees and students that cannot be present at an event. Event recording provides everyone with the opportunity to review and gain insight into the live experience. SMP 352 processors can be adapted to many applications, documenting virtually any meeting or conference. They are ideal for use in corporate, education, government, healthcare, courtroom, house of worship, and rental and staging applications.